Sun, 7 Aug 2016 at 11:08 p.m. Your correspondent was heartened to read Saturday’s ODT editorial. It was mostly on the money, apart from the fabrication that Delta pays a dividend most years, when it is well known that for many years it borrowed to provide dividends, and it will not pay a dividend for the next three years. Mayor Cull is a either a devious and unfaithful turnip or he is a blundering nincompoop. Given his disgusting complicity with DCHL Chair Crombie, last week, making simply absurd and risible statements as to why Delta CEO Cameron did not need to appear at the Council meeting and explain to Council how Delta, for the third time, had created a stinking financial mess, and done so under his approval to proceed at Noble in 2009, to build an illegal and unconsented subdivision. All Mayor Cull had to do to show some integrity and leadership was to insist to Delta and DCHL that Mr Cameron appear as per Councillors Vandervis and Calvert’s request. Ratepayers now know that he is unfit to be Mayor and has not a shred of any concern for the interests of Ratepayers but is simply part of the Dunedin establishment who protect each other. It is clear a great many Ratepayers have already come to this conclusion : As part of his mayoral campaign, Mayor Cull’s Facebook page invited feedback in recent weeks and it was so overwhelmed by negative and derisive comments – that he could not refute – that he simply stopped attempting to respond after two attempts. Readers should find the site – it may well have been taken down after the avalanche of negative feedback – and make THEIR views of Mr Cull known. Named and shamed the four Delta Directors, Frow, McLauchlan, Kempton and Parton, and that they contributed to the history of “secrecy and limited transparency” of Delta, a culture that “continues to envelope a company which is effectively owned by ratepayers”. ODT readers did not have to join too many dots to see that the ODT is saying that these directors are not fit to be directors of a Ratepayer owned company and need to be sacked. This is very strong (and welcomed) from the ODT. We should consider the curious case of Mr McLauchlan, who has had his nose in the Delta trough since 2007 : It was around that time that Mr McLauchlan gave accounting evidence to the High Court for Scenic Circle in a dispute, reported in the ODT, with the co-owner over the then –new Scenic Circle Dunedin City Hotel. Mr McLauchlan, as seems to be the pattern with Delta, tried to tell the Court that black was white, that effectively, debits were credits and vice versa. Unfortunately for Mr McLauchlan, the opposing side had a much more credible accounting witness, whose evidence was the complete opposite of Mr McLauchlan’s. Needless to say the Court much preferred the evidence of the opposing side, so it is a statement of fact that the Courts have found Mr McLauchlan to be an unreliable witness. One wonders if Delta knew this when they appointed him, or if it was part of the job description…. And then there was the other curious case of Mr McLauchlan’s short tenure as the “Crown Monitor” for the SDHB, where an outgoing board member publicly questioned if he had any utility at all, and what did he actually do for the approximate $30,000 a year he received for acting as the Crown Monitor. Mr McLauchlan then confirmed to the ODT he hadn’t actually done anything as Crown Monitor except attend the board meetings and make some phone calls to Wellington. He had not written any reports – at all. The ODT did not dwell on CEO Grady Cameron. Your correspondent was wrong in his last post – Mr Cameron was not left to sweat it out in front of Council, but probably had so much dirt on the Directors and DCHL that they could not risk him appearing, and they conspired to put Mr Crombie in front of Council. However, the true dirt tonight is the identity of ‘The Buyer'(?) of the Noble Subdivision : (ODT – feel free to pick this up and make any inquiry you want). It is of course truly unbelievable that Council would approve a loan of $13.4M to a buyer that they do not know, which shows that a wholesale cleanout of Councillors is necessary. More on that later. However, Councillors are not going to want to know the identity of the Buyer because they make the dismal NIL (Noble Investments Ltd), Tom Kain, Gordon Stewart, et al look like paragons of commercial acumen. Your correspondent’s information is that the Buyer may be or very well includes Infinity (of Wanaka). A caveat, readers : We seek through the glass, darkly, and are not privy to the full machinations of Mr Crombie and his cronies. It will not be certain until this is confirmed publicly, but we do know that Delta, via Mr Murray Frost, have been working on this “arrangement” for months. Perhaps the ODT might like to make inquiries of Mr Paul Croft, General Manager and CFO of Infinity Investment Group Holdings…. Now at one level Infinity and Delta are birds of a very, very similar feather, and it is clear why they would seek to stick together : Like Delta, this will be Infinity’s third attempt at a Canterbury subdivision. Like Delta, the other two have been failures. Readers, hold those cups of Tiger Tea tight…. Infinity’s abysmal financial performance on those projects makes Delta look like seasoned and competent professionals !!! The amazing truth that is stranger than fiction : Infinity have lost MUCH MUCH MORE than Delta on their two failed Canterbury projects…… IN EXCESS OF $100M. I can hear the teacups rattling now, readers, “Prove it CD, prove it ! !” Elementary, my dear readers : Here is the link to the Stuff.co.nz story that appeared last year. It takes a special effort to lose $100M on one deal, but Infinity pulled it off. Perhaps Delta’s Mr Cameron and CFO Dixon, having had their subdivision trainer wheels on since 2009, are ready to move up to the big leagues at Infinity and lose serious amounts of someone else’s money. It beggars belief that Mr Frost, who has been acting for Delta (but mostly Noble, it appears), would actively court Infinity as the Buyer, and place at risk $13.4M of Dunedin Ratepayers’ money with a company with this recent history; when there was a far safer option of Dunedin City Council taking control of the project, perhaps in concert with a developer that HAD NOT lost $100M on the same sort of project. Let us not forget either, the other $12M that Mr Crombie has “given up on” reported by the ODT last week, as though it were a trifle as light as air. If it were your money, Mr Crombie, I don’t think you would be quite so cavalier. Readers should remember that essentially the deal is that the Buyer (Infinity ?) will pay around $2.7M to Gold Band Finance, and $1M to Delta (probably for consultant and court costs !) and NO OTHER MONEY CHANGES HANDS. If that is the best that Delta / Gold Band could do I will eat my tea cosy. Bottom line : This deal smacks of cronyism. And here is the interesting part : Murray Frost, Graham Crombie and Stuart McLauchlan are all well known to each other. We hope that there will be assurances that there will be NO INVOLVEMENT or REMUNERATION either directly or indirectly to these three, or any other Delta or DCHL personnel, on the Noble Subdivision. Mr Crombie – as someone allegedly with an IQ greater than room temperature – how could you think this deal passes the smell test for a Ratepayer owned company ? What if? understands you conspired to conceal key information about this deal from Councillors. As the ODT infers, you are a pathetic guardian for the Ratepayers’ interests and you need to conduct that cost/benefit analysis we advised you to do months ago, and prepare the resignation letter – before a new mayor orders a “review” of the DCHL structure, which as we all know is code for : “Get rid of those incompetents, ASAP”. Interesting to note that at the time of writing any search on Infinity Group on the internet comes up with a message saying “you are not permitted to access”. BUT, if the search is via Paul Croft, then we find the huge number of companies that he is a director of. Some really interesting companies there, but one stands out to me and that is Infinity Yaldhurst Ltd which was formed in February of this year. The only director is Paul Croft and all 10,000 shares are owned by the parent company Infinity Investments Group. So, why would this Wanaka company set up a company specifically naming Yaldhurst? Hmm. And at the beginning of the year? So, who knew what? Did the “turnip” know? Who else? 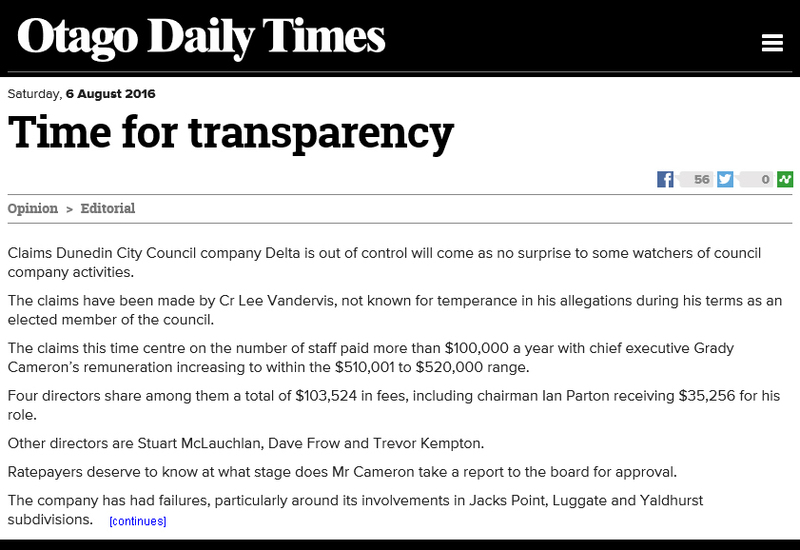 Transparency is one of the things that were promised when Chin was voted out and Dunedin ratepayers need to determine whether transparency is what was delivered. The obvious reason for setting up a new company is to limit liability; this Infinity Yaldhurst company has 10,000, probably $1 shares, meaning in the absence of a guarantee from the parent company, its maximum liability in the event of Noble’s failure, is $10,000. Nobody with a gram of commercial intelligence would entrust a $13m debt to a company with effectively no security. Thanks ian – quite so. We have been quietly drilling last days. More soon. There’s negative commercial intelligence here. The Gold Band first mortgage that Delta had purchased 67.5% of (in two tranches over the years) was known to Delta and Councillors at the time of their 1 Aug 2016 vote to be at about $8.5m – so Delta’s 67.5% of the first mortgage was $5.7m. Delta recommended, and Councillors voted, to accept just $0.9m of this $5.7m first ranking first mortgage debt legally due to it from the first mortgagee sale (this is completely separate to other second mortgage and agreement to first mortgage securities Delta held to secure the infrastructure debt). That means the $4.8m shortfall ($5.7m less $0.9m) was given back to the developer as a cash injection and “secured” within the $12.5m second mortgage. ie the $12.5m second mortgage isn’t just securing previous infrastructure debt, it’s securing the $4.8m Delta/DCC cash injection, and only $7.7m of the around $25m actual infrastructure + interest debt. If “Infinity” decide to go belly up like “Noble” decided to and also pass the property, or go belly up like Infinity did at Pegasus, then Delta and Cull’s Council stand to lose not only the $25m debt but also the 1 Aug 2016 $4.8m cash injection. Observer, the questions I get from ian pillans, and on further reflection, is WHICH “Infinity” or “Infinity Group” did the Dunedin City Councillors “think” they were in a deal with on 1 August ? And with WHAT security or guarantee ? There are a large number of Infinity companies. Elizabeth, did DC Councillors even care to inquire past the spelling “Infinity”? I know that Councillors and the DCC refused the request from the caveating neighbours with known prior interests in the land to redeem the first mortgage and transfer it to DCC. (That in itself is a crime under s102 for the Property Law Act). This would have enabled DCC to own the approx $8.5m first mortgage outright, and to also convert and register Delta’s $5m second mortgage plus their about $15m agreements for first mortgages. That would have given DCC a total first ranking first mortgage of between $20m and $30m. Has DCC replied at all to caveator letters ? No they haven’t Elizabeth. I’ve asked questions under LGOIMA well over 20 working days ago and haven’t had an answer to them either. Suggest you complain to the Ombudsman direct re your LGOIMA requests. There are several people including myself who are currently very worried by DCC’s inability to respond within the 20 working day limit for LGOIMAs – and who plan to make complaints to the Ombudsman as their time allows. This is a serious compliance matter. “I hear the teacups rattle, hear the mighty Delta roar, tryin’ to put in Smart Meters, don’t know what they’re for. I’m stuck with a Delta shortfall, doin’ time. I’m here in Delta Prison, all the time”. (Albert! Albert! You put on some fool from the Bethell, NY State Art Fair, 1969. That’s not progressive). Invention is your score. Delta is pure radio. Found. Emails to ‘whomever’ from Steph Davey, receptionist…. That’s the people that do the work. All of the Infinity stuff goes back to their holding company and the shares in that are owned by Pamela Higgins who has 1.8m shares or 45%, Jen Robertson with 1.2m or 30% and the CEO, Paul Croft has 1m shares or 45%. Jen Robertson appears to the widow of the founder of Infinity. All live in Wanaka/Albert Town. That’s right. It’s the “owners” we’re following – Paul Croft in particular since his name came up 3-4 months ago in a phone interview CD initiated. Long story. The emails (Steph Davey) are from a legal discovery process. See the PC personal business history (google). We’ve all heard of heat-seeking missiles. Well here’s Dunedin’s amazing trough-seeking Mister! How do you know a stoat has been in your chicken run? The scale and manner of destruction. It kills far more than it can eat and there are headless chooks everywhere. Where are our local MPs? List and electorate. Given they represent us have they had anything to say? Or is it a case of hands off, nothing to do with us, local government, you know? You would think they had a gold mine here by putting pressure on the government and the Local Government Minister in particular to act. Ok. Forget Michael Woodhouse. He doesn’t speak up for Dunedin that much. His own career to think of beyond little Dunedin. Peter, MPs don’t give a flying rooster. They are troughers. They belong to the club. We have resort to other processes to tidy this one. Private people have put something like +$800,000 of their own money into the legal fight(s) – we applaud and support them and what they stand for. They are both humble, smart, investigative and tenacious : the original landowners and caveators of the Nobel Subdivision application. CD and I, with others, are forging ahead free of unnecessary bureaucracy in the ways we can to bring different pressures to bear. We remain in daily contact by helicopter. Many parties in that dark looking glass CD mentions : the constructive fraud case linked to other legal action pending. Hopefully, another process will launch soon to clean up rotting turnips, a 4WD heavy tractor unit with polished steel plough, slicing them into the ground. Politicians usually join the party once they know which way the wind is definitely blowing. If possible, they seize the opportunity to claim credit. If not possible they get a photo opp with the people who have done the donkey work. Peter, I think in this case MPs have no openings whatsoever and should politely piss off or be negatively implicated. Ministers of Local Government have been/are a run of imbeciles. Electorate MPs are typically out of their league with such financial complexities. The malcontents are heavy litigators. Noble, not for the unresearched or lightweights. Poor stoat. The chooks were ‘headless’ before he got there. Chooks torn into little pieces by the stoats. I feel sorry for them as i am one of the chooks!